Learn to write your research paper using the APA citation. The APA (American Psychological Association) style has become a common method of citing sources in psychology, education, and the social sciences. Under this form of writing style, an APA citation is used to credit sources from which information was collected. By doing so, writers can prevent accusations of plagiarism and bring credibility to their work. An APA citation is the way that writers bring credit and attention to outside sources of information. The MLA citation comes in two different forms: the parenthetical citation and the works cited page. 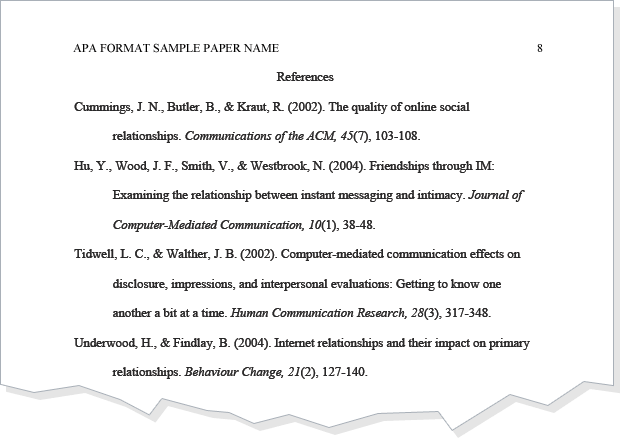 APA citation example: References page. As the term suggests, an in-text citation is a method used to refer to the works of others within the text of your work. The in-text APA citation consists of the author’s last name and year of publication for the referenced work. A reference list, located at the end of the paper, will contain the citation in greater detail. Include each in-text citation in the reference list. This allows the audience to access the source from which the information was obtained. Providing an APA citation allows present plagiarism accusations and brings credibility to an author’s work. Learn how MindView makes APA formatting easier. Click here. Capitalize the names of authors including initials. Italicize or underline the titles of works such as books, television series, or albums. Use quotations for articles and song titles. If authors have the same last name, then include the first initial to differentiate them. The reference page must begin on a separate page from the essay and coordinate with all in-text citations used throughout the text. This ensures that all APA citations are accounted for from its original source. Moreover, a writer provides credibility for the work and the audience knows where to look if more information is desired on the topic. “Reference” title located at the top, center of the page. Do not bold, underline, or italicize “Reference”. Indent the 2nd and subsequent lines of each works cited entry. Alphabetize entries by last name of the author. Italicize book and journal titles. Do not italicize, underline, or quote journal articles or essays.